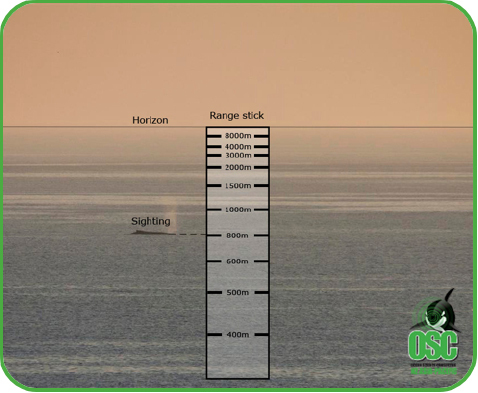 Estimating range to sightings is a key skill for Marine Mammal Observers (MMOs). Described here is how to make, and use a range stick. To make a range stick a small wooden stick, or paper-covered ruler is required. Measure your eye height above sea level which is the sum of your eye height (with work boots on), and the height of your observation platform. Also, measure your outstretched arm length to eye. To make a range stick, horizontal lines, which correspond to ranges, are marked onto the stick or ruler (see example below). In order to determine position of the lines, enter your measurements into the range stick program, which can be downloaded here. Values are calculated automatically, and specify the distance in cm from the top of the stick to where a horizontal line must be drawn. Make sure you put what distance the line corresponds too. Not all distances need to be marked on the range stick, but be sure to include key ones, such as exclusion zones. Keeping the range stick vertical, hold it in your out stretched arm. Line the top of the range stick with the horizon, and read off the range that aligns with the target.